The latest stage of Samoëns’ fast-paced development brings the resort’s second high-performance, detachable chairlift; the TSD6 Coulouvrier, which is due to open Christmas 2017. Autrichian lift experts Doppelmayr won the bid for the construction of what will be Europe’s longest lift of its kind. Climbing an impressive 944 vertical metres over a distance of 2574m, the Coulouvrier lift will be capable of transporting 3000 passengers/hour at a speed of 6 metres/second. This 6-seat Doppelmayer chairlift comes as part of a long term expansion plan developed to correspond with the arrival of Club Med at Samoëns 1600. 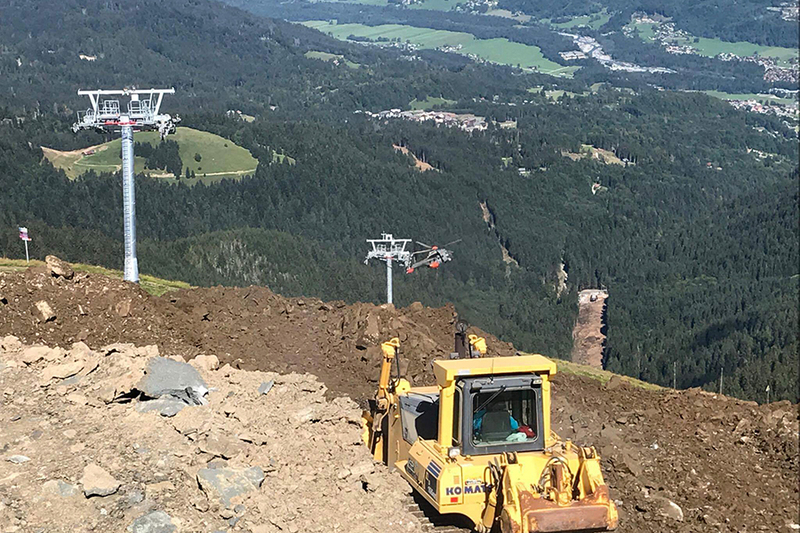 It will replace two aging fixed chairlifts (Lanche and Gouilles Rouges) and in doing so opens up an entire new valley between Samoëns and Morillon. To compensate for the environmental impact of opening up the Coulouvrier valley to skiers, Samoëns’ commune has chosen to set aside a vast tract of land in the Cirque de Vaconnant (between Samoëns and Gers) for permanent protection. Construction of the departure station is currently well underway at the foot of the Coulouvrier valley (Echarny), at an altitude of 1160m. The arrival station at 2105m is also nearing completion at the Tête de Saix. This winter, two new blue pistes will allow ski access to the speedy new Coulouvrier lift from both Samoëns and Morillon. From Samoëns, skiers will descend a new blue piste from the bottom of the Babûches button lift which will lead them through the forests of Vercland to link up with the Coulouvrier lift. From Morillon, a new red piste will continue from where the Lanche chairlift once was, taking skiers down to the Coulouvrier base station. While the time frame is too tight to build more pistes this winter, additional new pistes are planned for coming years. In order to maintain the excellent on-piste conditions we’ve all come to expect, the Grand Massif has also invested heavily in both snow canons and the water retention zones required to feed them. 70 new snow canons will ensure quality on-piste skiing in the Coulouvrier bowl and with them, a 35,000m2 water storage system is to be installed at Samoëns’ Lac des Gouilles. A vital junction linking the Massif and Grand Massif resorts, the Tête de Saix itself has also undergone a radical makeover this summer. 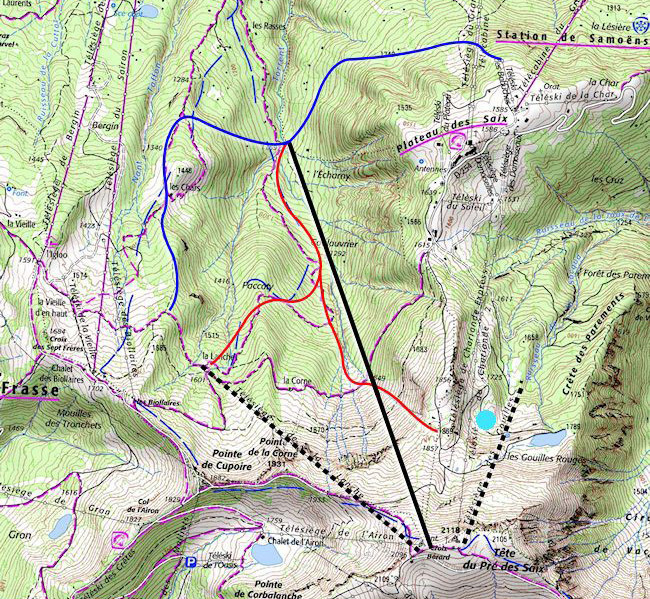 Large-scale earthworks have now been completed to flatten this zone into an easily navigable plateau, allowing smooth and safe movement of ski traffic between resorts. The Coulouvrier lift signals the completion of the Tête de Saix’s modernisation plan. Six underperforming fixed lifts have now been replaced by three performant 6-seat detachable lifts and a 4-seat lift. There will be far fewer pylons to interrupt the landscape and skiing between the Grand Massif’s resorts will be a breeze. Have something to say about this project? Leave your thoughts below!